Your studio is as lovely as ever. You have much more restraint then I did.. I went to Target thinking I was going to just get a couple coffee mugs and it turned out quite a different story. If only I had someone to talk some sense into me instead of enabling my shopping habits! well, although i have not made the utmost challenge commitment officially, i try tif, i try, and so i happened to be at target on this most special day sunday and i saw, touched & fondled a bit of Liberty of London, i even smelt a scarf real quickly when the aisle was empty, was so tempted (i was taken by a rain hat and umberella of the floweriest kind) to skip happily to the register with a floral purchase in hand...but lo and behold i talked meself out of any purchase, started conversations in my head about how the rain has stopped, do you really need a wallet, now you go home and lay out that old fabric sitting alone on its shelf & give it new life...so i emptied my hands of my newfound loves, and as i walked out the doors of target, a bit heavy of heart, i glanced back with a wee smile for i was proud and had found liberty in california. Could you at least have the bag? It's made from upcycled Liberty of London bill boards and is rather lovely! I have not yet seen the Liberty of London collection for Targé in person, but I heard via Facebook friends that our local store sold out of practically everything on their shelves yesterday. These lovely goodies do indeed look tempting online, but I must say that since I've devoted myself to thrifty, handmade ways and the Dottie Angel challenge, shopping for new things is simply uninspiring. All I see in what used to be my favorite stores is brand new crappity crap. 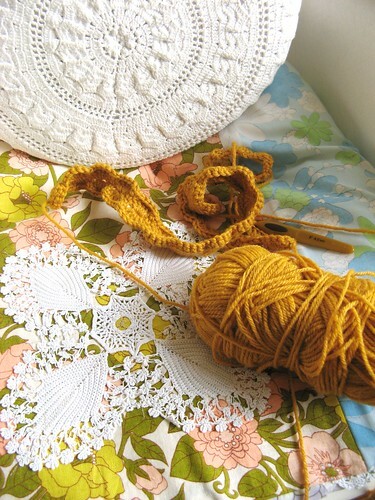 It all leaves me feeling very let down in the end...I much prefer the musty smell of the local Sally Army, the carefully color-coordinated displays at Goodwill, flea market chaos, and the pure goodness of needle and thread and yarn. Thank you for this post! Your blog has been one of my very favorites ever since I discovered it a few months ago, but I believe this is my first time to comment. I have been arguing with myself over the past two days whether or not to go to Target to see if there is any of the new Liberty of London that I "need". Of course there isn't! And, you have helped me make up my mind not to go and see. So, thank you! Well, are we nearly half way through? I have to admit that my months of lurgy (not getting competitive here) have also helped me not to spend - mind you, I didn't earn, either! Congrats on getting so creative, and get well soon! 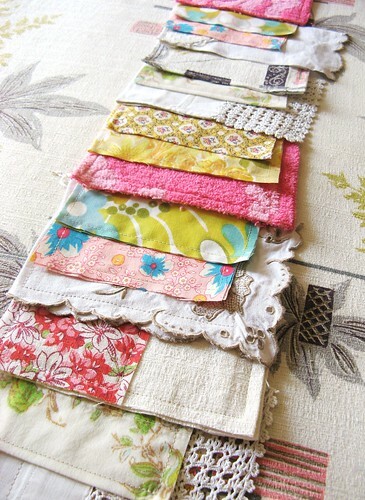 As always...love all the stuff you make...you have inspired me to go work on a pretty apron. I need one for the upcoming flea market to hold my monies! Come visit my blog as I have a fun jewelry giveaway! i caught a cold on the weekend too, still managed op shopping sat morning but spent most of the weekend knitting. wow! amazing work, are you from Seattle? gardening gloves! I have seen the Liberty Target line and I want and like your beautiful items more! Suddenly their stuff doesn't look so good. I looked at Target first thing yesterday morning to see what Liberty things were on offer....everything i was interested was "sorry, this item is not in stock". Sold out already?! The only thing I would really buy would be a shirt for my husband but, they were all gone, on-line anyway. They can have their stuff! 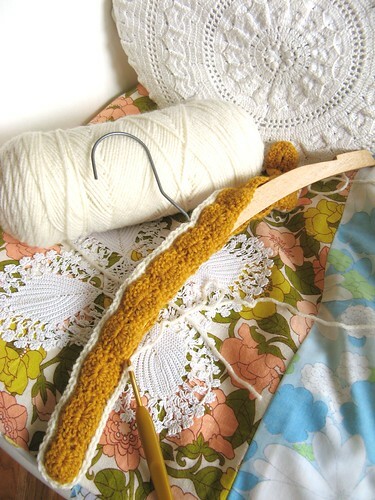 Love the hangers and your studio....so warm and welcoming! vickie, my wooden hangers are thrifted. you can on occasion find them on the vintage aisles of etsy but these i found out and about. be good my lovelies without me! If it makes you feel better, as I filled my cart with Liberty of London storage boxes, flower pots (and gloves), a chair, lampshades and lamp bases, pillows, serving trays,rubber boots and scarves, I thought how dottie angelish these pieces all look! The lampshades and bases were half off already at my local Target here in the suburbs of Chicago...couldn't say no to that! so kind of mr lurgy to at least make himself useful. That's such a beautiful room. 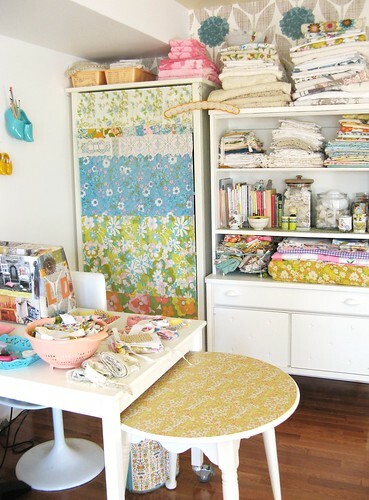 It makes me want to get my sewing room in order. good for you! 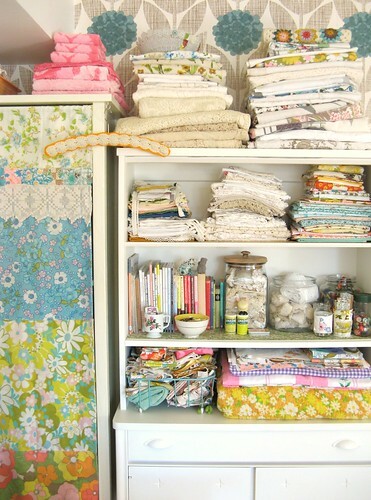 you should be proud of yourself as liberty of london is very tempting indeed...and your studio looks fabulous! I saw the Target stuff in person, and honestly everything you made in much nicer. The Liberty designs are great of course, but all the women's clothes are polyester, and so are the sheet sets! Good for you! I'm pleased to hear that you resisted temtation, though I am sorry to hear you are unwell - I hope you are better very soon. 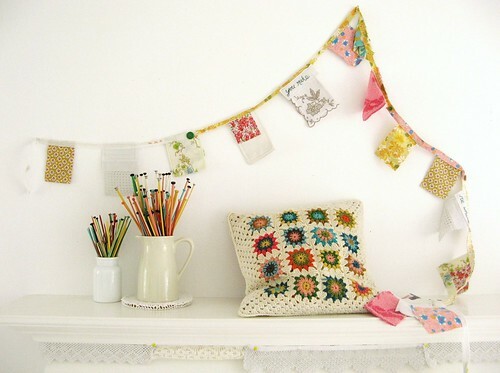 Your coat hangers turned out beautifully, and I so love your whatnot garland! I think you need to treat yourself to some Liberty delights after naughty Mr Lurgy's visit. Go on, you know you want to. I am really hoping that there are some Liberty goodies left when we visit Florida next month.I am also hoping I will actually find a Target store! I'm glad you resisted the temptation. You will be able to look back on this moment for moral support. I this comment will be short. On my way to Target to see what all the hullabaloo is about ! ! ! Crickey, I feel sick - that horrible yearning in the pit of your stomach you only get when you desperately want something you can't have! Whilst I appreciate you sharing your angst, I've just jumped on your link to Target and had to have a quiet moment whilst I recovered from the slendour that was Liberty of London. It's a cruel, cruel world. I feek your pain! I moved out of London in December and so can no longer visit Liberty whenever I need some good cheer. I rarely bought anything mind, just being there and soaking up the ambience usually did the trick! I too had a visit from Mr Lurgy last week. Got loads of knitting done! I wonder what non-crafters do when they're ill? As always, you blog is a ray of sunshine. Stay you, and good luck with the challenge! I thought of you on Sunday and considered leaving you a pep-talk comment. Alas, I did not do so as I thought to myself, "Why would a comment from a complete stranger have any meaning for the Dottie Angel?" Now I wish I had taken the time to do so. A local Target started putting items out on Thursday so I'd already seen much of the inventory before Sunday. I was rather disappointed by what I saw because the colors seemed dingy to me. Even so, I rushed to Target on Sunday morning, arriving at 7:50 a.m. to find absolutely no one in the parking lot. (Very surprised about that because I truly thought there would be crowds waiting for the store to open.) As it was, a British lady and I were the first ones in the store (of course, that was precisely when you and your day -long trial came to mind). Miss Tif, if you had grand-daughters your heart could rightfully ache at the restrictions placed by your "Challenge of the Utmost Kind." Honestly, if the little girl's clothing had been made in larger sizes I would have bought everything they offered. As it was, not a single grown-up piece came home with me. Well. They come home for a day and were returned on Monday. In the end, only the "Zip Around Wallet - Susanna Green" and the "Babydoll - Maddsie C & Martha" are still with me. And the babydoll will only stay if I can figure out how to wear it in public. Um. I'm very optimistic. As you have a wonderful sense of design, an appreciation of colors and an eye for quality, odds are you too would have been disappointed. Yesterday as I waited for my BC's flight to arrive I reached the intersection of "drive straight and go to Target to wander the isle of Liberty" and "turn left and find that Goodwill I've heard about." As I waited at the red light I wavered for a moment but when the green flashed I made my left. And man-o-man, a more fabulous thrifting afternoon I've not had in a looooooooong while - complete with a homemade by some sweet hand in the 70's bright turquoise wool dress that fits like a glove - SWOON! I decided I did not need anything of Liberty as well. The store was pretty cleaned out when I went, so that helped my decision. Is the pattern for the crochet covers above available online? I would love to try my hand at them! I prefer to think nobody will buy that stuff at Target, and Target will eventually be forced to donate it to the local salvation army as Target does in my area with their items which don't sell. Then I will swoop in and buy it at my local thrift shop. Mission accomplished. just wanted to throw this your way. still wrestling with Mr Lurgy but inbetween a few bouts of wrestling i am 'a crafting'!! I fear I fell off the handmade path this weekend with Liberty of London myself, it was too tempting. But your beautiful hangers have me back on the straight and narrow. Do offer them in your shop at some point honey. and while we are not doing the challenge for the full year I was very excited to get my husband on board for six months and I am secretly hoping to extend it when the time comes. Anyway, thanks for being an inspiration and I was very happy to read that you stuck to your guns. And you never know some of that Liberty for London might show up in a thrift shop before too long. oh gosh yes!! I walked right past those Liberty fabric totes calling my name!! ugh! 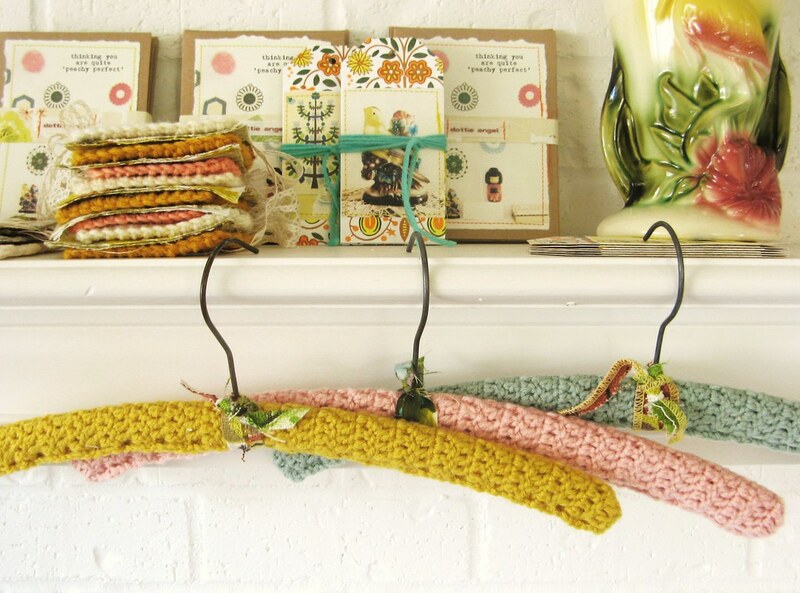 oh how I love your crocheted hangers, they're lovely! Good for you! I fell. I fell hard. I went for a wallet. The one thing that I thought that I needed the most. I was so strong until I turned the isle and ran smack dab into the little girls clothes. I wanted them all! I settled for a dress and a swimsuit but am still dreaming about the skirts, flip flops, denim romper, skirts, etc. Good gracious! I succumbed to the Liberty of London bag and feel happier with it slung across my shoulder. Oh, help! And I must know about your floral yellow wallpaper. I love it as much as your others. Where ever did it come from? Thank you Tif. I am off to the Graham and Brown site this minute. I feel a wallpaper project coming on! Good for you! Not to knock your willpower, but much of the Target merchandise is not well-made. The women's clothing I saw in particular was rather shoddy. The girls' dresses though were great! (Sorry.) The umbrellas are adorable but I doubt they will last a season without the ribbon ripping off. (I broke down and bought one anyway.) And the stores around here were awful - half-empty shelves and nothing but promises of future merchandise. So good for you, making lovely things yourself instead of wasting money and time on things that are pretty on the surface, but poorly made. I know this is late to the party, but good for you. L of L stuff IS gorgeous, but it is still just stuff. Mass-produced who-knows-where by who-knows-whom stuff. The fawning over it in the blogosphere has been so excessive that I now refuse to go and purchase it just out of annoyance. that's it, I'm out... the Liberty of London Gardening gloves and bras and underwear and ok a blouse did me in. (I did name my daughter after them after all)So, while I do constantly buy most everything second hand, I guess-a challenger of the utmost kind, I am not. 55 comments, OHMY! But I will comment anyway because I have come this far and you need to know that I love the colors of your home, will be stealing this color set for my new studio and am thankful for the inspiration. Love. 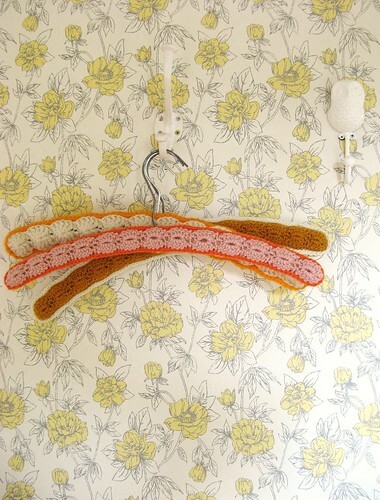 So, I do love your coat hangers. But I am having a hard time finding the hangers. Do you have any suggestions , yours look new, are they. the hangers i use are not new, they are from the thriftstore, i bought them in a bundle. I would love to feature your studio on the vintage sheet blog: http://vintagesheets.blogspot.com please let me know if that would be all right.